Niess, M.L. (2006). Guest Editorial: Preparing Teachers to Teach Mathematics With Technology. 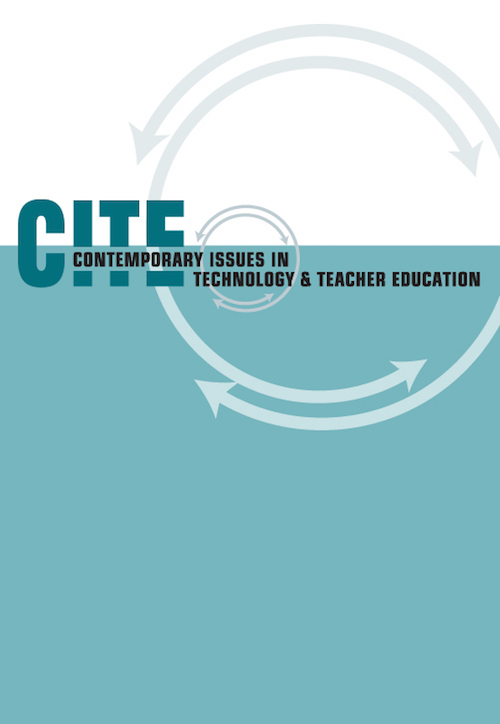 Contemporary Issues in Technology and Teacher Education, 6 (2), 195-203. Waynesville, NC USA: Society for Information Technology & Teacher Education. Retrieved April 24, 2019 from https://www.learntechlib.org/primary/p/22932/. Beck, J.A., & Wynn, H.C. (1998). Technology in teacher education: Progress along the continuum. (ERIC Document Reproduction No. ED 424 212). Grossman, P.L. (1989). A study in contrast: Sources of pedagogical content knowledge for secondary English. Journal of Teachers Education, 40(5), 24-31. Grossman, P.L. (1991). Overcoming the apprenticeship of observation in teacher education coursework. Teaching and Teacher Education, 7, 245-257.
International Society for Technology in Education. (2002). National educational technology standards for teachers: Preparing teachers to use technology. Eugene, OR: Author. Margerum-Leys, J., & Marx, R.W. (2002). Teacher knowledge of educational technology: A study of student teacher/mentor teacher pairs. Journal of Educational Computing Research, 26(4), 427-462. National Research Council. (2000). How people learn. Washington, DC: National Academy Press. National Research Council. (2001). Adding it up: Helping children learn mathematics. Washington, DC: National Academy Press. Norton, S., McRobbier, C.J., & Cooper, T.J. (2000). Exploring secondary mathematics teachers’ reasons for not using computers in their teaching: Five case studies. Journal of Research on Computing in Education, 33 (1). Pierson, M.E. (2001). Technology integration practice as a function of pedagogical expertise. Journal of Research on Computing in Education, 33(4), 413-429. Rogers, E. (1995). Diffusion of innovations. New York: The Free Press of Simon& Schuster Inc. The Development of Technological Pedagogical Content Knowledge in “Technology, Pedagogy and Mathematics” Courses in the U.S.